In Scottsdale Arizona, the average car weighs about 4000 pounds. That’s two tons. A large, heavy-duty pickup truck can weigh in at over 10,000 pounds, or five tons. What is arguably the most important feature that keeps these vehicles from colliding? The brakes. So if you aren’t sure that your brakes are operating at optimal efficiency it’s vital to have your Scottsdale auto mechanic inspect them to determine if you are in need of brake repair. There is a lot of misinformation circulating about everything these days. Let’s discuss a few of the common myths regarding brake auto repair in Scottsdale. It may be common to hear brakes squeal, but that doesn’t mean it’s okay. Any sound your brakes make can mean something. That squealing noise is an intentional safety feature to tell you that your brake pads are nearly worn out. Once your brakes began to squeal the brake pads are worn down and the studs beneath are scratching the drums. Many brake pads have a small piece of metal embedded in them to make that squealing sound once the brake pads have worn down to the point where they should be replaced. It’s known as the brake indicator sound, and it doesn’t just happen when you are braking, it’s a constant sound as you drive down the street. If you ignore the squealing, your brakes will eventually begin to make a grinding sound. That grinding sound generally means that the brake pad is totally worn away leaving the metal part of the brake rubbing against the metal brake rotor. This will damage the rotor and make brake repair much more expensive. As a matter of fact, some shady mechanics will tell you that all brakes squeal and it’s nothing to worry about. Their motive is to wait until the discs and rotors are also damaged, possibly along with the calipers and master cylinder. This can turn a $200 brake repair into a $1000 brake repair. Since brakes are intentionally designed to make noises when they are wearing out, it’s extremely important to have your brakes checked by your mechanic when you begin to hear these sounds. But worn brake pads are far from being the only problem your brakes may have. If you notice any change in stopping ability, such as your brake pedal going down farther than normal, your vehicle taking longer than normal to come to a stop when you apply the brakes, or if your brakes begin to “grab” these are all warning signs that you need to see your Scottsdale mechanic for brake repair. There are a few reasons your brake fluid may be low, none of them are good. In older vehicles people could safely just top off their brake fluid. Newer vehicles are not designed this way. The most serious reason for your brake fluid to be low is a leak somewhere in the brake lines. Your brakes cannot operate properly without the correct amount of brake fluid. In addition, many late model vehicles contain a sensor that will begin to release small amounts of brake fluid as a warning to let you know that it’s time for new brake pads. “Have your brakes checked every 5000 miles” would be a better way of putting it. The wear and tear on your brakes depends greatly on your driving habits. Like anything else, the more you use them more quickly they will wear out. So if you live in a large city with lots of stop and go traffic your brakes will wear out much more quickly than someone who lives in a rural area and does mostly highway driving. Here is how to check for wear on your disc brakes. Squat down and look at your brake pads through the opening between the wheel spokes. The outer pad should be pressed against the metal rotor and there should be at least one quarter inch of pad visible. If your brake pads are thinner than that you should have them inspected by a mechanic to see if it’s time to replace them. Today’s brakes are more technologically advanced and made of more high-tech long-lasting materials, but they are still considered a wear items meaning that eventually they will wear out. Although today you can purchase brake pads labeled “lifetime”, they don’t actually state how long constitutes a lifetime. In addition, other components such as the rotors, master cylinder, calipers, and brake module can also wear out. Your mechanic can often tell where the problem lies by the symptoms you describe. Hopefully this has cleared up some myths. If you have any doubts about the condition of your brakes, it’s best to have them checked by a professional mechanic. Brakes are probably the most important safety feature of your vehicle. If you’re in need of brake repair or are having any other automotive problems the licensed, professional mechanics at Scottsdale Muffler & Automotive have both the experience and the latest technology available to repair your vehicle quickly and efficiently, at a surprisingly reasonable price. 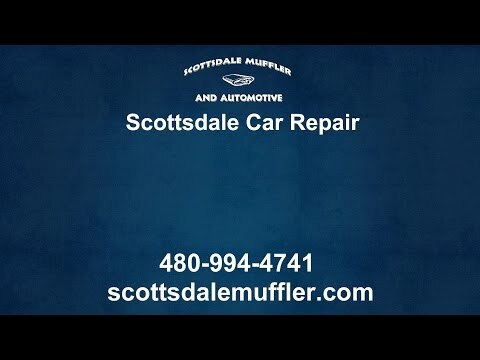 Scottsdale Muffler & Automotive is a family run business with decades of experience. Even though they make you feel like family, this isn’t a small time business. Scottsdale Muffler & Automotive provides continuing education for their mechanics and stays abreast of the latest technology, such as using computerized diagnostic equipment in order to save time and avoid mistakes when repairing your vehicle. Contact us today for more information!